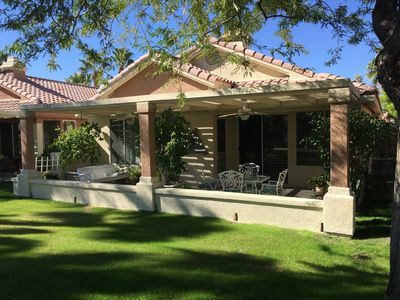 We love our completely remodeled home in the desert and we hope you will too! 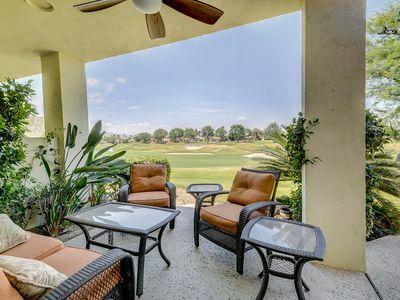 Drink your morning coffee and enjoy the sunrises from the covered and furnished patio or relax in the afternoon with your cold cocktail enjoying the serenity - and twilight golfers. 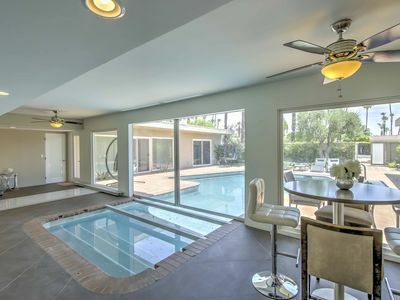 This spacious, fully furnished 2 story, 3 bedroom, 2.5 bathroom, NON-SMOKING condominium, is approximately 1800 square feet and beautifully nestled in the heart of Palm Desert. 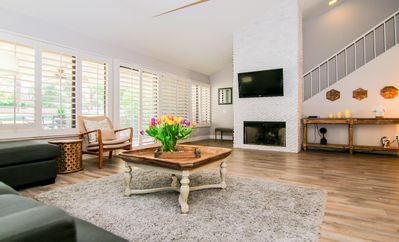 Extra large master suite is located by itself on the second floor affording the renter extraordinary quiet and privacy features a king size bed, sitting area, ceiling fan, large closets and private bathroom with shower. 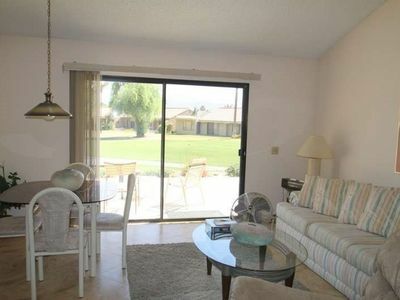 The second of the 3 bedrooms has a queen size bed, ceiling fan, large walk-in closet, and private bathroom with shower. 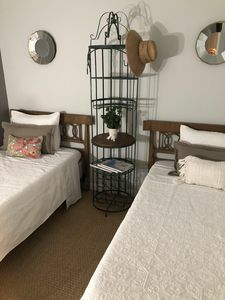 The third bedroom features bunk beds, full size on bottom with twin on top, daybed, office area, small library, and bathroom located across the hall. 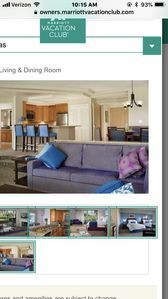 The newly remodeled open kitchen features stainless steel appliances for your dining and entertaining activities. 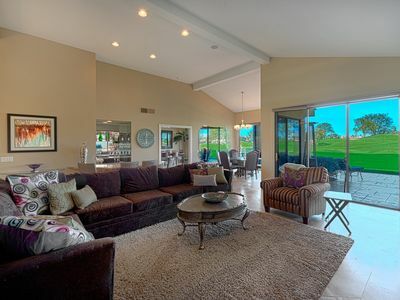 The kitchen opens up to the living and dining areas. The counter has seating for three. The dining table comfortably seats six people. 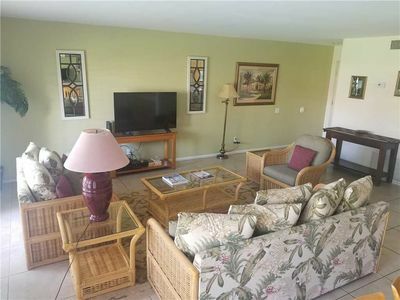 The living room is open and includes grand fireplace and flat screen TV. 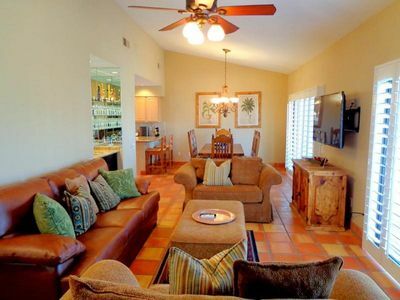 Other amenities in the home include a washer & dryer , garage, cable TV and wireless Internet throughout the house. 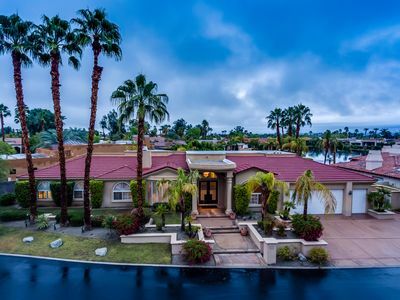 This home is arranged to maximize the outdoor experience in the Desert with a generous patio, gas BBQ, outdoor dining furniture and luscious landscaping, featuring a spectacular view of the 4th Fairway of Woodhaven Country Club. 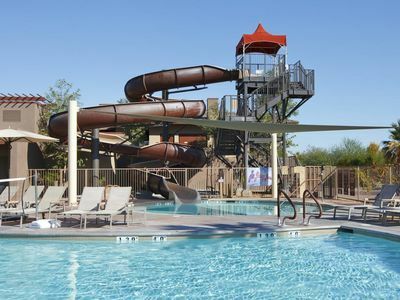 As a guest, you are invited to enjoy the weekly activities and dinners provided to the members while enjoying your stay at Woodhaven Country Club. 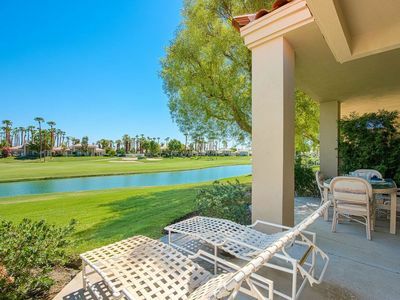 Woodhaven is the 18-hole golf course you will want to play here in the Coachella Valley. Woodhaven's facilities include a gorgeous 18-hole golf course, par 70, a 34,000 square foot clubhouse with dining room, snack bar, pro shop, exercise room (treadmills, elliptical machines, and weights), steam room and massage services and men's and women's locker rooms. Woodhaven offers discounted rates to Woodhaven residents and guests who wish to purchase a monthly golf membership, for more information, please contact (760) 345-7636. In addition, there are eight tennis courts (4 lighted) and a tennis shop. 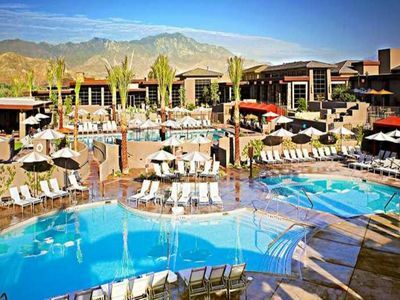 The development offers 4 pools and spas conveniently located at each corner. 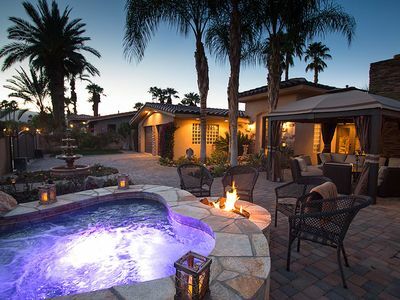 Woodhaven is known as one of the premier communities in the desert. 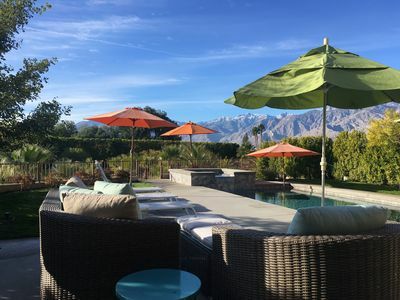 It is literally minutes away from Indian Wells Tennis Center, cultural and recreational activities to include the Palm Desert Mall, the Riverwalk Shopping Center, in Rancho Mirage and McCallum Theatre for the Performing Arts, Palm Desert’s state-of-the-art center for performances of all kinds. 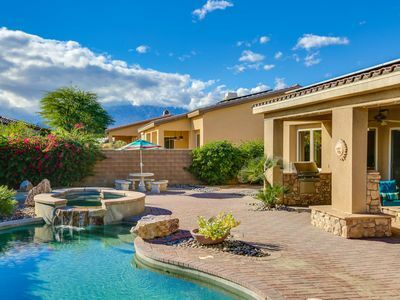 We are located close to El Paseo Drive with fabulous shopping and restaurants and just up the street from Indian Wells, La Quinta, Rancho Mirage, Palm Springs and the Living Desert. 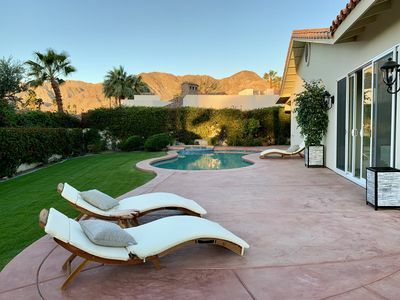 The weather is absolutely beautiful in the desert November – April (May is also pleasant) so please consider these months while making your vacation plans. 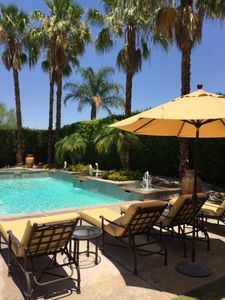 We trust you will enjoy our desert oasis as much as we do and that your vacation in our residence will be the epitome of relaxation and pleasure. Just Released! Brand new Golf Villa-Close to Festivals!